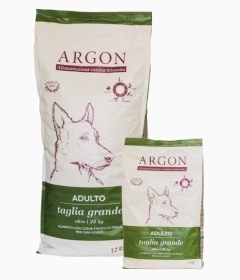 Argon is a line of foods designed to meet the nutritional needs of dogs, puppies and adults, of small, medium and large size. 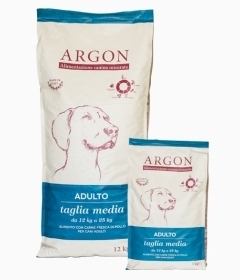 The line Argon’s recipes are characterized by a high percentage of fresh meat, guarantee of a great nutritional value and the extreme digestibility. 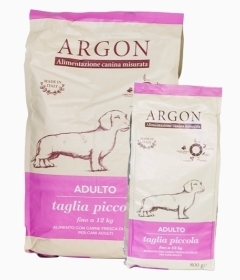 The proposals of Argon line, free of dyes and preservatives, are enhanced by natural raw material and rich in fiber, such as yucca and green pea , acting on the digestive process and favoring the optimal absorption of nutrients. The recipe contains a high level of fresh chicken-meat, with high biological value proteins, highly digestible. It contains rice, a simple ceral, light and easily digestible and easily assimilated by the body. It also contain Yucca and green pea create the ideal substrate for digestion and for an optimal absorption of nutrients by the digestive system. In the recipe for adult of small breed dog there is balanced and thoughtful addiction of cardioprotector substances such as taurine and L-carnitine to protect it from heart problems typical of small breeds. The exclusive presence of fresh pork meat brings to the daily diet of your dog protein with biological value that makas this highly digestible, light and suitable for dogs with food hypersensitivity. The recipe contains a high level of fresh chicken-meat that brings to daily diet of your puppy proteins with high biological value, highly digestible. It contains rice, a simple cereal, light and easily digestible and easily assimilated by the body. Yucca and green pea create the ideal substrate for digestion and for an optimal absorption of nutrients by digestive system. The intake of essential fatty acids contained in fish and flax seed , in synergy with the B vitamins found in yeast , counteract the effects of natural aging by helping your dog to stay younger in time . The exclusive presence of fresh pork meat contributes to the daily diet of your dog protein with biological value that makes this highly digestible, light and food suitable for dogs with food hypersensitivity. The recipe contains a high level of fresh chicken-meat that brings to the daily diet of your puppy proteins with a high biological value, highly digestible. It contains rice, a simple cereal, light and easily digestible and easily assimilated by the body. It also contains yucca and green pea that create the ideal substrate for digestion and for an optimal absorption of nutrients by the digestive system. The intake of essential fatty acids contained in fish and flax seed , in synergy with the B vitamins found in yeast , contrast the effects of natural aging by helping your dog to stay younger in time . The exclusive presence of fresh pork meat brings to the daily diet of your dog protein with biological value, highly digestible, light and food suitable for dogs with food hypersensitivity.